This resource includes 'Ready, Set, Read!' 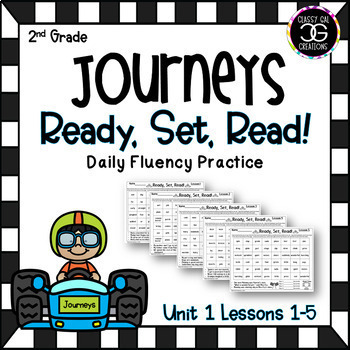 fluency pages - one for each lesson, Lessons 1-5 (Unit 1), of the HMH Journeys Second Grade series. The fluency pages consist of story vocabulary, spelling words, high frequency words, and sentences directly from the student text for each lesson in Unit 1. Students are timed by a family member, paraprofessional, or classmate each day to practice fluency and increase their speed while reading. The goal of these practice pages is for students to increase their accuracy and fluency while challenging themselves to do better each day. Ready, Set, Read! pages are an EXCELLENT school-home connection that only takes minutes (or less!) each day to complete. I would LOVE to hear from you! Please be sure to leave feedback and let me know what you think of this resource. Please 'follow' my store to be informed when new resources become available. Units 2-6 will be uploaded SOON!